A synthetic porous ceramic composite material consisting of the mullite, cordierite and cristobalite phases is produced from a mixture of paper pulp waste and clay by reaction sintering at 1400°C. Physicomechanical properties such as bulk density, porosity, cold crushing strength and cold modulus of rupture have been studied. The presence of mullite, cordierite, cristobalite and quartz as major phases and montellecite, tatanite, forsterite and anorthite as minor phases have been confirmed by X-ray diffraction pattern. SEM studies revealed the presence of well developed needle shaped mullite and quartz crystals. 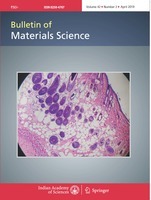 The paper also discusses the possible uses of this type of porous composite material. 15 wt% flyash (a calcined byproduct of thermal power plant) was incorporated in a normal triaxial kaolin–quartz–feldspar system by replacing equivalent amount of quartz. The differences in microstructural evolution on heating the compact mass of both normal and flyash-containing porcelain at different temperatures (1150–1300°C) were examined using scanning electron microscopy (SEM) operating in secondary electron image (SEI) mode. Microstructure of normal porcelain did not show the presence of mullite and quartz grains at 1200°C and the viscosity of silica-rich glass restricted the growth of mullite crystals at 1250°C. Flyash porcelain, on the other hand, shows the presence of primary mullite aggregates in the clay relict and a significant growth of mullite crystals in a low viscosity glassy matrix at 1200°C itself. At 1300°C, both the bodies show a larger region of more elongated (&gt; 1 𝜇m) secondary mullite along with clusters of smaller sized primary mullite (&lt; 1 𝜇m). Small primary mullite crystals in the clay relict can be distinguished from elongated secondary mullite crystals in the feldspar relict in their size. Primary mullite aggregates remain stable also at higher temperatures. XRD studies were carried out for quantitative estimation of quartz, mullite and glass, which supported the SEM observations. An attempt was also made to correlate their mechanical strength with the constituent phases. Titania was progressively added in the range 3–9 wt% into a triaxial porcelain body consisting of clay, quartz and feldspar. The composed bodies were heated at five different temperatures in the range 1200–1400°C and their fired properties as well as phases evolved were studied. The results revealed that beyond 1300°C, formation of more liquid phases caused bloating in samples which led to generation of pores. This effect is more pronounced in TiO2 containing samples. In the present system, 1300°C appeared to be the optimum temperature at which porosity was almost negligible and strength was maximum (45 MPa), particularly in presence of TiO2. From the results of XRD studies, it was revealed that quartz content primarily decreased with increase in TiO2 content due to excess glass formation and its subsequent dissolution. Mullite content increased with increase in TiO2 content. No significant effect was observed beyond 6 wt% addition. Microstructure primarily showed the presence of quartz grain and cluster of smaller sized primary mullite crystals in both the samples without and with TiO2. Very few secondary mullite crystals were also observed. SEM picture of sample containing 9 wt% TiO2 showed some grain boundary crack due to cooling stress generated in the glassy phase. The drastic reduction of residual strength after 8 cycles of heating at 800°C and cooling particularly in TiO2 containing samples suggests controlled heat treatment of the vitrified samples necessary to promote secondary crystallization process for the enhancement of strength. Attempts have also been made to correlate the constitutional parameters with the properties. Titania doped vitrified triaxial porcelain samples were subjected to controlled heat treatment at different temperatures of 600, 800 and 1000°C with a specific heating schedule. The results revealed that flexural strength of 800°C heat treated sample was significantly enhanced to 60 MPa from its original value of 40 MPa. XRD pattern revealed the formation of mullite in the system both before and after heat treatment and the differences in their growth was ascertained through SEM analysis. The present heat treatment process may be useful to produce high strength porcelain body from a common triaxial system. Presence of iron compounds as impurities in kaolin and feldspar, impart reddish colour to ceramic products manufactured using these minerals. The quality of kaolin and feldspar was enriched mainly through iron removal by biological methods. Bacteria isolated from kaolin of Indian origin were used for bioleaching. Biotreatment of kaolin and feldspar using indigenous bacteria not only lowered the iron content of the minerals but also improved their whiteness. The porcelain prepared with these biobeneficiated minerals was compared to that prepared with non-beneficiated one. Physico-mechanical properties of porcelain were distinctly improved by using biobeneficiated kaolin and feldspar, without affecting the individual mineralogical compositions of kaolin and feldspar. In the present study, anorthite (CaAl2Si2O8) porcelain was fabricated using Ca(OH)2, Al(OH)3, quartz, aluminous cement and feldspar as raw materials. Two compositions were formulated (coded as CAQ and CFQ)and their physico-mechanical properties (%AP, BD, flexural strength) were studied and compared. CAQ (21.2 wt% Ca(OH)2, 44.5 wt% Al(OH)3 and 34.3 wt% quartz) shows very poor densification and strength even after heating at 1450° C, although anorthite formation is observed on heating it at various temperatures. On the other hand, CFQ (48.6 wt% aluminous cement, 29.37 wt% feldspar and 22.06 wt% quartz) achieved full densification and superior strength at 1450° C with more anorthite formation compared to CAQ. X-ray diffraction and scanning electron microscope studies were also carried out to analyse the phase and microstructure evolution. The coefficient of thermal expansion of the anorthite-based sample was found to be lower than quartz and mullite porcelain which suggests its application as cooking ware.